Congratulations to our new QuiBidder of the Week, Antonio! Antonio has been a great addition to the QuiBids community on Facebook for a long time now. He’s always been super helpful and kind to other QuiBidders he meets on our page. In fact, Antonio is such a good person that another QuiBidder won a gift for him on QuiBids! Read on to hear the story. 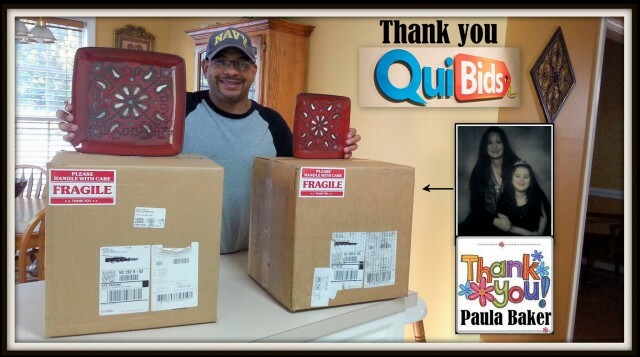 Do you want to share your QuiBids story to be featured on our blog as the next QuiBidder of the Week? Just post a picture on our Facebook page of you with the product you won, then tell us a little about your experience in the photo’s description. Be sure to use the hashtag #QoW. If your photo is chosen, you’ll be featured as our next QuiBidder of the Week, PLUS you’ll earn a 2X Gameplay and 100 Top QuiBidders points. Go here to learn more. “Besides saying thank you to QuiBids, I just want to take this little space to say thank you to a very special and wonderful person. Not long ago, I won an American Atelier Marquee 16-Piece Dinnerware Set – Red, This set serves 4 people. That amazing person that I am talking about won a similar set a couple weeks later and She decided to give it to me as a gift because she knew that I was trying to win another set and it was getting very hard for me to win it. Without a laptop or desktop computer, she just won her set bidding from her cellular phone, something that is not easy to do because its little screen and phones are a little more slower than a computer. This awesome person is PAULA B!!! Jenny & I were so excited when we opened up her gift! It was a thing that we definitely wanted. Thank you so much Paula for your generosity. We truly appreciate it. But more importantly, thank you for being a such wonderful angel, Paula. Words can not express how blessed we are to have a amazing friend like you! Be sure to congratulate Antonio in the comments below. Don’t forget to enter to be the next QoW by posting your photo on our Facebook page! Click HERE to see Live Auctions!